NHS Choices website purports to give the general public information and advice about a wide range of health matters. My impression is that many see the NHS Choices website as a portal for honest, trustworthy and balanced health advice. A couple of weeks back, I noticed that Paul Nuki, Editor of NHS Choices, had tweeted a link to an NHS Choices infographic about the hazards of salt in the diet. On following the link, I found myself being informed that if the UK public were to reduce salt consumption by 1 g a day, this would save 4,147 lives each year as a result of a reduced risk of cardiovascular events such as heart attack and stroke. I do like to check the sources of these sorts of claims wherever possible, but the reference for this claim simply read ‘Department of Health’. This is not a reference. This is really no better than me listing as a reference ‘My Uncle Harry’. If one is going to make a claim such as this, then it is incumbent upon NHS Choices to provide the actual evidence on which it is based. I asked Paul Nuki for the evidence. 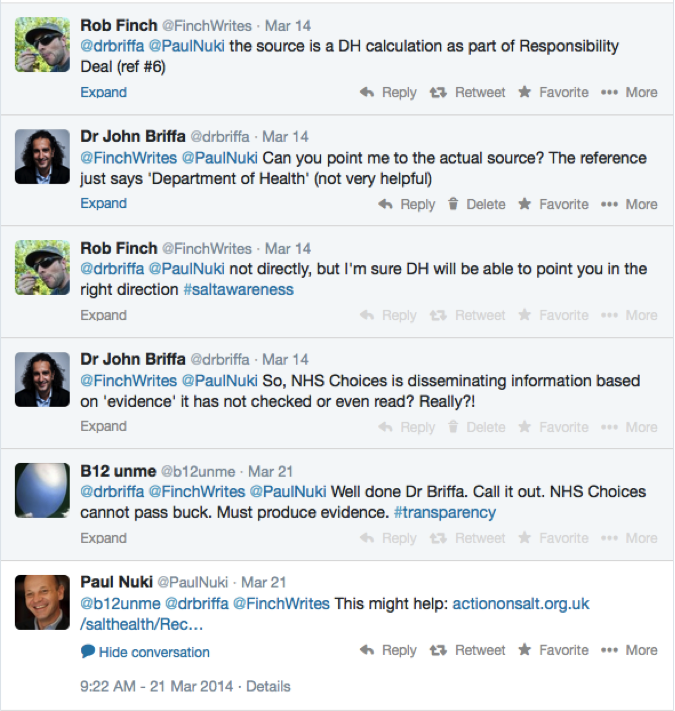 His colleague, Rob Finch, replied, and you can see our exchange here. 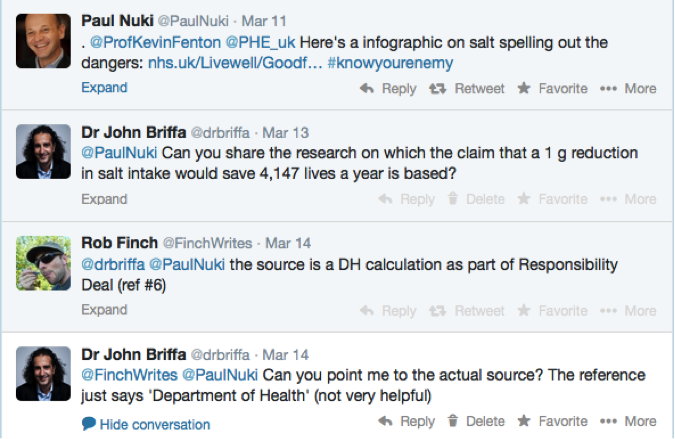 Please note that Rob Finch fobbed me off by referring me to the Department of Health. No reference was supplied, and somehow I think Rob Finch’s glib manner signalled that he thought this was perfectly acceptable behaviour. I didn’t, which provoked my comment about NHS Choices appearing to be happy to support its assertions by quoting evidence it seemed to be utterly unfamiliar with. A full week later, Paul Nuki finally came back to me with a link to this study . Dating from 2003, this piece of research summarises the evidence regarding the blood pressure reductions that come from salt restriction in the diet. The first thing that occurred to me is that this piece of research had, seemingly, nothing to do with the Department of Health reference cited in the infographic. But, can the quoted study even be used to justify the claim about lives saved? The research is actually based on studies that assessed the impact of salt restriction on blood pressure. The authors have then extrapolated the modest reductions seen in blood pressure to reductions in deaths due to strokes and heart disease. Nowhere in the paper are there any calculations based on reductions in salt consumption of 1 g per day (the specific salt reduction quoted in the infographic). Also, nowhere in the paper do the authors explain how they calculated reductions in blood pressure to reductions in deaths. Critically, at no point do they explain why we cannot be assured that reductions in blood pressure will translate into health benefits. The authors have, in fact, made a huge assumption here. If we want to know if salt restriction saves lives, then we require studies that assess the impact this intervention has on ‘hard clinical endpoints’ like deaths from heart attacks, and overall risk of death (overall mortality). Do we have such data? Yes, we do, and the relevant evidence has been summarised by researchers from the Cochrane Collaboration (whose self-appointed job it is to do proper reviews of the evidence concerning clinical endpoints). The last time Cochrane researchers reviewed the evidence was in 2013 , though this review was subsequently withdrawn when they became doubtful about the trustworthiness of some data they had used which suggested that salt restriction might actually increase the risk of death in those suffering from heart failure. And this was despite salt reduction in these studies was generally greater than the 1 g reduction quoted in the NHS Choices infographic. According to this evidence, the number of lives saved by an average 1 g reduction in salt intake per day would be precisely none. In don’t take Rob Finch’s dismissal of my request personally, but I do feel it smacks of arrogance and a lack of professionalism. But, for me, worse than that is the fact that NHS Choices seems happy to quote evidence that it seems to have dragged out of nowhere, especially when I’d say it is soundly trumped by evidence that focuses on all-important clinical endpoints. As I stated at the top of this piece, I think many people look to NHS Choices for trustworthy advice, and believe what this body says. NHS Choices has a duty, I think, to fulfil its brief properly, and I believe in this instance it has failed to do so. If NHS Choices would like to be seen as a credible source of health information, then I believe it needs to up its game considerably. Until that time, those keen on getting the facts may choose to give NHS Choices a miss, and seek their health advice elsewhere. Agree with your conclusions, the health advice on NHS choices is not good. Their recent article reviewing the Cambridge study which exonerated saturated fats is a case in point. They are still loathe to embrace this concept and the last time I looked the page still contained a video “Fats – the facts” which contradicted the findings of this study. Did you ever get a meeting with NHS Choices following the exchange you had about carbohydrates? The CEO Jonathan Carr-Brown wrote (in an email on 25 Feb) that he would ask someone to arrange for my visit. But since then I’ve heard nothing. We read today that fraud and incompetence is costing the NHS £7bn a year. In its own small way, the NHS Choices website contributes to that. It fails to live up to its own prescription of evidence-based advice. Dr Briffa’s examples prove that beyond ambiguity. So either the Choices site is misleadingly trite “mood music” put together by people either too stupid or lazy to care about the true implications and requirements of evidence, or it’s something more sinister. There is no benign interpretation. Apparently this is no more true than some of their health advice. What apparently happened was hat they got hold of some figures for a number of health systems, including commercial ones, averaged the figures, claimed the NHS was average and ascribed that figure to the NHS. I would suspect that systems with entirely private hospitals and insurance companies involved have greater incentives to fraud. No doubt they think putting (low ) in front of everything is sufficient for the masses.ie LOW fat,LOW salt ,LOW cholesterol. LOW life’s then,one and all. Isn’t Paul Nuki the same one who called proponents of low-carb diets “quacks”? Dr. John, as always a good piece. What I would like to see mentioned (perhaps not specifically here) is that a reduction in processed foods, would automatically cause a reduction in salt intake. People are told to red nutrition labels, which is both bothersome and time consuming, nt to mention almost impossible for those with poor eyesight! I gave up doing that years ago, as there are no labels on fresh fruits, vegetables, meat and fish! This is an excellent commentary. Whenever I’m explaining someone not to be worried about eating too much salt or becoming obsessive about avoiding it, I will refer to this article amongst others as a point of reference. There is now an increasing body of people who are aware of these myths and this is thanks to the work of people like you. Without wishing to sound overly fawning I’d like to take a moment to appreciate what you do. I have made up my mind long ago about the foolishness of restricting salt but this remains just an opinion until someone like you takes the effort to dig out the research. And this in itself requires real expertise to separate the chaff from the wheat (ie: identifying the real science as opposed to the pharma advertising masquerading as evidence based medicine). Serving the truth requires time and energy and money. This blog is a public service. Thank you. The problem is of course, that NHS Choices is is taken seriously, at least by those who are less informed, ie by those who do not read blogs such as these. Sadly, that accounts for the vast majority. Even worse, it’s accepted wisdom for the vast majority of the medical profession. Bold statements need real proof to be taken seriosly. Otherwise the messenger will lose it’s credibility and be considerd a joke. Statements without real proof has to reflect the weak nature of the evidence. A hypothesis isn’t evidence even with the best of intensions. A vivid imagination isn’t going to cut the mustard. When my son, (now a healthy adult) was a baby, he was operated on for a Patent Ductus Arteriosus. We were told by the doctors at Great Ormond St that he should always have a diet low in salt. Was this unnecessary? And I’ve read recently that if you have a low carbohydrate diet you should increase salt intake – is that sound advice? When I studied Biology at O Level (yes, I am THAT old), we were taught that the kidneys control the level of sodium in the bloodstream and maintain the correct level. Eat more salt, and you will excrete it. Eat less, and you won’t excrete it. This is simple schoolboy biology. In the early 1990s, a group of self-appointed ‘experts’ decided to pursue their pet issue and called themselves ‘Consensus Action On Salt’, and as an ‘organisation’, managed to get press coverage. From memory, this group had members numbering less than 10 when formed, but have a major grievance about dietary salt and typical of most pressure groups, will publish articles with frightening statistics that did not come from research, but made great headlines. I understand that some people ARE sensitive to salt and can suffer very high blood pressure as a result. However, these people know who they are – because their doctors told them. The rest of the population is not affected in this way, and there is no need to reduce salt. In the 1970s, I seem to recall that you could buy salt tablets if you were the type that liked climbing mountains and suchlike as you may have sweated away too much sodium. This of course was the period when people ate lard and eggs. How would their doctors be able to tell them? How many doctors regularly do a serum sodium test on hypertensive patients? The easiest way to test whether or not your blood pressure is sensitive to salt is to test at home with a blood pressure machine. Chances are that salt makes no significant difference and restricting salt does more harm than good. How much salt should you consume? Test and find out. did anyone read Malcolm Kendriks piece on Italian nuns, salt and blood pressure? Puts it all in perspective really. Keep up the excellent work Dr.Briffa. Down with ultracrepidarians, up with common sense and the truth! Nice word – albeit a fancy term for an ad hominem attack. The shoemaker should be allowed to comment on whatever he likes, the soundness of his argument depending on the evidence, not his profession. I tweeted them about this same thing, roundly ignored. Great to see B12unme tweeting about it too. She campaigns brilliantly for b12 deficiency testing and treatment to be changed as the serum b12 assay is hopeless. In my own campaigning for better thyroid testing and treatment, the editor of Pulse magazine claimed that no one denied Quality Outcome Framework points were a financial incentive when GPs said otherwise. With six points ( 1 point = £154 ) for diagnosing and treating with levothyroxine for hypothyroidism versus 31 points for diagnosing depression, is it any wonder we are left ill? I find that my salt intake is self regulating anyway. On days that I’m low on salt I can put a tonne of the stuff on my food and barely taste the saltiness it just tastes really nice. On other days just a small amount of salt will taste quite strong. It’s not a scientifically controlled study but I’ve found that people on a forum I frequent with symptoms of low sodium or potassium while low carbing also report that they barely taste salt until they’ve consumed enough that their symptoms disappear. Why are we being encouraged to reduce the consumption of something that is self regulating anyway? My Lord I heard this very same thing on Sky News and also thought exactly about the research. Yip there was a deal alright, but was it responsible? Sorry to be so negative but I cannot find a cardiologist in the entire South Africa who will support my high fat diet (LCHF) even on presenting my dramatic blood work. How does someone’s cholestersol go down from 12 to 6 and a doctor still thinks the diet’s all wrong for me. No bravery to be had in medicine. Delighted to see you continuing to wield the baton against the corrupt and incompetent NHS. It is an organisation dominated by financial considerations, ignorance and incompetence paid for by our taxes. Until the state monopoly is dismantled and people be held accountable nothing will improve. I find it ironic that we in the so called alternative field are far more evidenced based and concerned with patient health than any self serving bureaucrat and 99% of doctors. Despite the evidence given to the House of Commons by the Editor of the BMJ has the campaign for the flu jab stopped? No. I recently sent a withering letter to my GP to stop wasting public funds and failing to practise evidenced based medicine with significant harms. Of course I have yet to receive a reply. Please keep up the good work. “So funny I just got a letter today from my surgery with a load of unasked for health advice on it. I know more about nutrition than the doctors practise. I am going to send it back with my corrections. Don’t add salt to food or eat salty foods. I have a doctor’s appt on Monday on another matter and will take their advice with me along with the scored out markings of mine. I told them to consult Dr John Briffa, Dr Eric Berg or go to http://www.fmtv.com/hungry-for-change before sending any more of these bad nutrition letters out. And people wonder why obesity is increasing the world over in developed countries!!! I’m not from your country, but GOOD FOR YOU GIRL!!! Few heroes out there. A stern word in this instance could work wonders. Thank you. There is a simple answer to the NHS and the problems created by it; like all monolithic structures it is too large, too centralised, too costly, and tries to apportion blame outwardly for the problems created by it. One reads contradictory information about salt but from personal experience I love it, take it generously, and would not do without it in my meals but recognise that one can overdose if one is foolish enough to do this. I was reading today (28/03/14) in the news media of paint-thinners being used in the processing of children’s cereals and we have the audacity to concern ourselves with a natural well tested product like salt? Carry on, carrying on! The NHS is a huge organisation full of excellent people. You can’t condem it on the actions of a website manager who is presumably paid to publish the current consensus view. But keep up the challenge. Remember the current consensus took a long time to become one, but is now slowly changing. Dr Briffa must have been wrong in his time so could perhaps reflect on the process of change. This surely is the way science progresses. You can. He is the face of the NHS. If there are excellent people in the huge organization they should take responsibility for his negligence and find someone who represents their excellence. I agree completely with Dr. Briffa. There is in fact a lot of data that suggests salt restriction increases risk of death. This is why when asked recently to give a statement on dietary salt and health, the IOM stated that there was insufficient data to support the current AHA recommendation to limit salt intake to 2300 in all Americans and 1500 mg in those with “increased risk” for heart disease. As we know, this is a typical approach of government when it gets involved in telling us what to do when it comes to our health. Decades of low fat eating are a testimony to the dangers in such an approach. Perhaps the government should stay away from the topic of nutrition and health and stick to advising people to wear seat belts! This is an excellent post because it highlights the difficulty of getting science, or even critical thought, into mainstream nutrition. Most people I encounter are content to be credulous on matters of nutrition. They want authority, not evidence. Pronouncements from authorities make life easy. Critical thinking, including the requiring of evidence, involves effort and daring. But it’s a habit that can be changed. When I ask people, ‘is there any evidence for that claim?’ I can see the wheels of ratiocination turning behind the blank stare. Great post Dr. Briffa! I love it where you repeat the question twice, eventually the other person will have to answer the question:) We need more doctors like you that look for scientific evidence to find answers. Well that didn’t go down too well with the doctor, especially the part about salt. I told him to go and research Dr John Briffa and others and to give serious consideration to the next health advice letter they send to their patients and he insisted the main part of your diet should be made up of cereals, bread, pasta, potatoes and rice. I don’t think he liked it when I disagreed with him. Oh well.